It’s not a secret that long layered hair has been a hit since first emerging on the fashion scene. Populating the pages of the top magazines in the world, it demands to be seen. If you have long hair, then you know the struggle. Brushing is a major workout, knots can cause all sorts of trouble, it sheds everywhere, and it’s a challenge to find the perfect style and cut to match your face and personality. 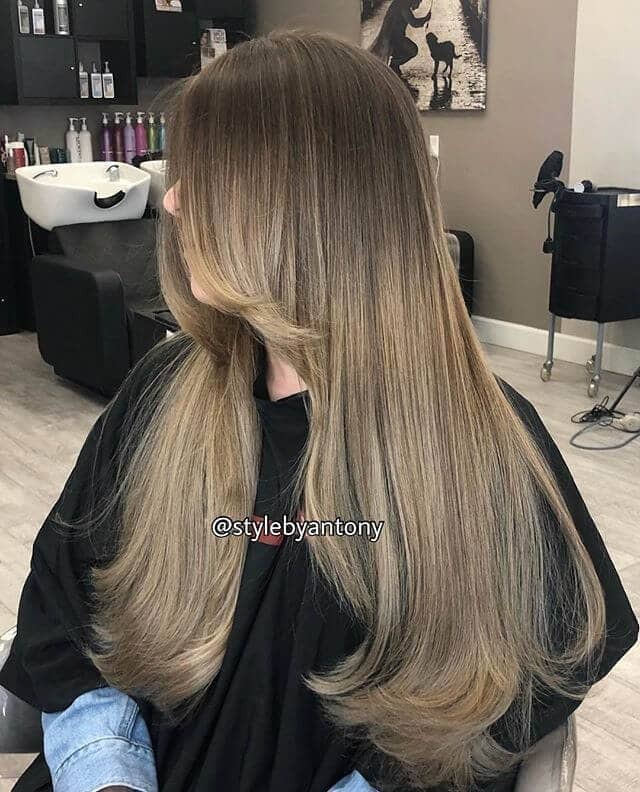 Long layers are the perfect choice to create an effortless style with a modern look, it gives you a salon style without spending the big bucks. It is easy to manage and it provides the illusion of voluminous hair and length. This is achieved by cutting the hair closest to the crown at a shorter length than the hair below. Where stylists separate themselves, however, is in the shape of the cuts in each layer. There are two major techniques when it comes to long hairstyles with layers. Each of these techniques can turn your hair into a work of art in the hands of the right stylist. The first is the sliding haircut which is achieved by sectioning the hair into four parts. Creating a soft layered end, the hair is cut at a 20-degree angle. 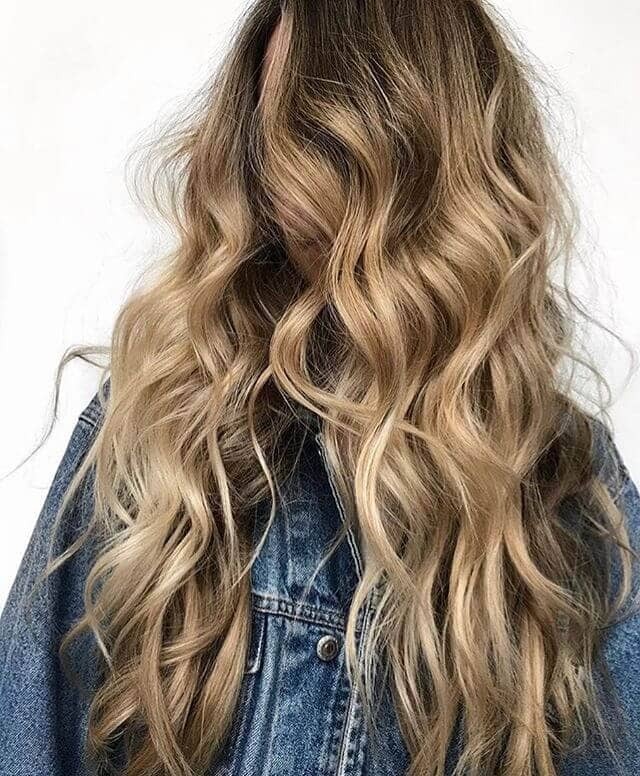 This is the perfect style for medium wavy textured hair. The second is the more complex blended elevation that you’ll find at high-end salons. In this type, the top section of the hair is cut at a 90-degree angle while the remaining hair on the sides is cut at a 180-degree angle. This is the perfect style for those without wavy hair. There is a layered look for every age and hair type. Thick and heavy hair can be lightened and thinned. 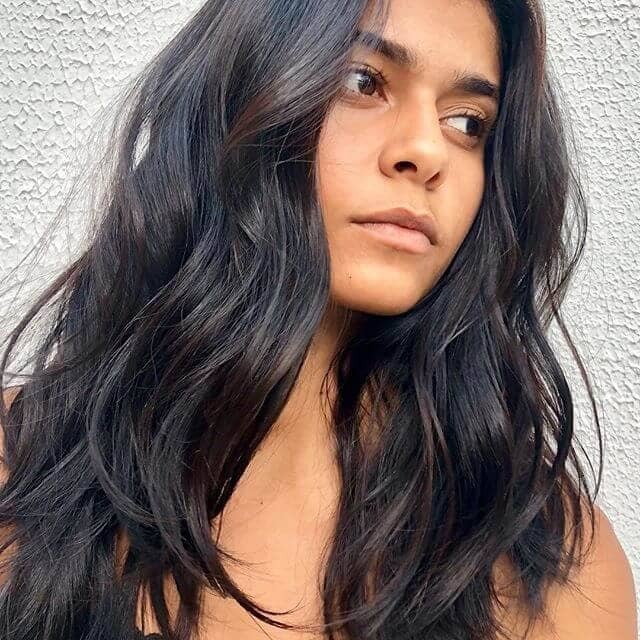 Fine hair is given volume and appears much fuller. Unruly, wavy hair can look like a real nest after a long day. Layering can clean up the lines allowing you to keep the waves with less maintenance and hassle. Take a look at the ideas and be inspired! 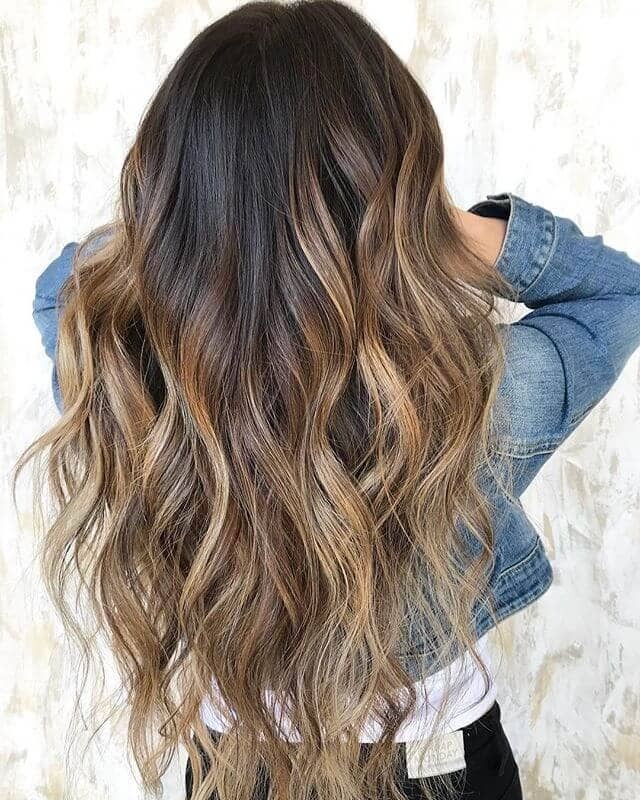 Thick, long and dark hair looks fabulous with dramatic golden highlights. A cute hairstyle for girls that frames the face well when paired with oval shaped faces. This layered look combined with multi-dimensional hair color provides endless styling options. These long layers are beautiful and versatile any time of the year. This natural layered look is an awesome “wash n’ go” style with a modern edge. This cute easy hairstyle with lightened low maintenance layers offers more longevity to the style. This clever cut and color combo will continue to grow and add greater texture with length. The dark roots and cool gradient color effect is a fantastic color choice for light and medium skin tones. 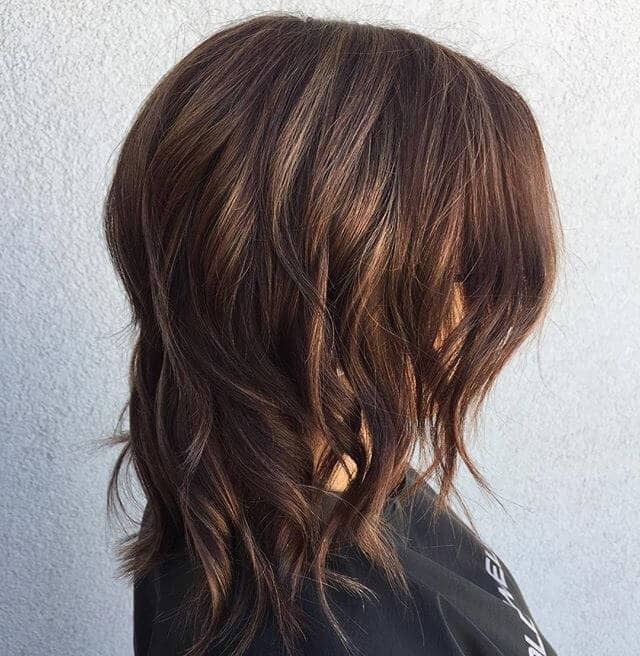 This naturally tousled look is boosted by subtle layers and dark and bold rich color. A fun and uncomplicated style that works well for dark skin complexions and women with thicker hair who want that soft shaggy effect. This natural looking style embraces that beachy and carefree look–a perfect hair idea for summer. A flirty and flyaway, this layered hairstyle is an awesome look for 2018. A simple and modern hairstyle that is ready for casual or dressy affairs–thanks to those side-swept bangs and soft tousle. This on the go look is perfect for low maintenance style, ready to tackle everyday life. Long layers make a pretty hairstyle for women looking for a fun everyday look. These understated and delicate layers add more depth to the lightly colored ends, demonstrating soft texture and volume. 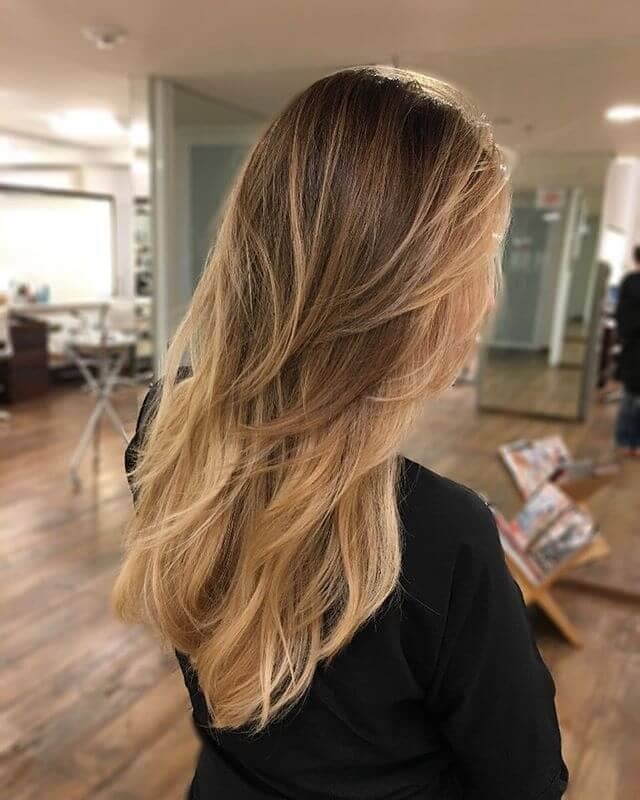 Multi-tonal hair colors can have more depth of interest when combined with layered cuts like this dark multi-tonal blonde and brown with soft layers. Adding soft curls to this layered hairstyle brings more femininity and deeper breadth of style. The golden honey and caramel highlight shimmers in these soft multi-length spirals. A cute hairstyle for women with medium-long hair lengths. This simple look is perfect for everyday use. These v-cut layers paired with soft and voluminous curls bring more movement and dimension to long hair. 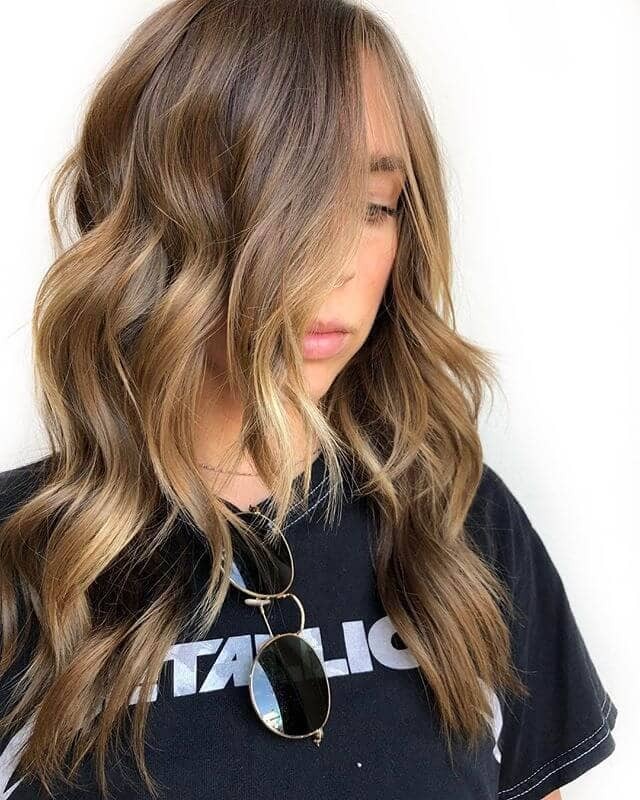 Chestnut brown with subtle golden highlights appear even more natural with v-cut layers that begin at the mid-length–with the ends taking on a sunlit feel. Shaggy layers add the most natural look when combined with this stunning shade of blonde. A great casual, no fuss, modern hairstyle. A great math for fairer skin types and fun lightweight hair while maintaining some length. This layered hairstyle is a fresh way to frame the face with a cute fringe. The most defining elements of long hair can occur with the addition of layers–long hair can appear even longer. This silky long layered hairstyle keeps all the length but adds much more attention to the length. The subdued layers begin at the shoulder and lend more definition and length to the remaining tendrils that fall beneath. 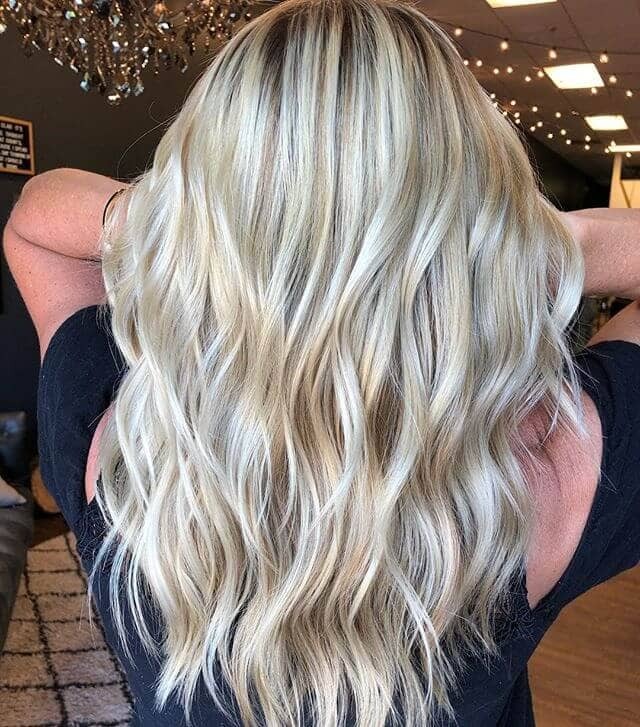 Thick and chunky layers have endless possibility–from shaggy tips to soft curls, thick layers are awesome and more defined. 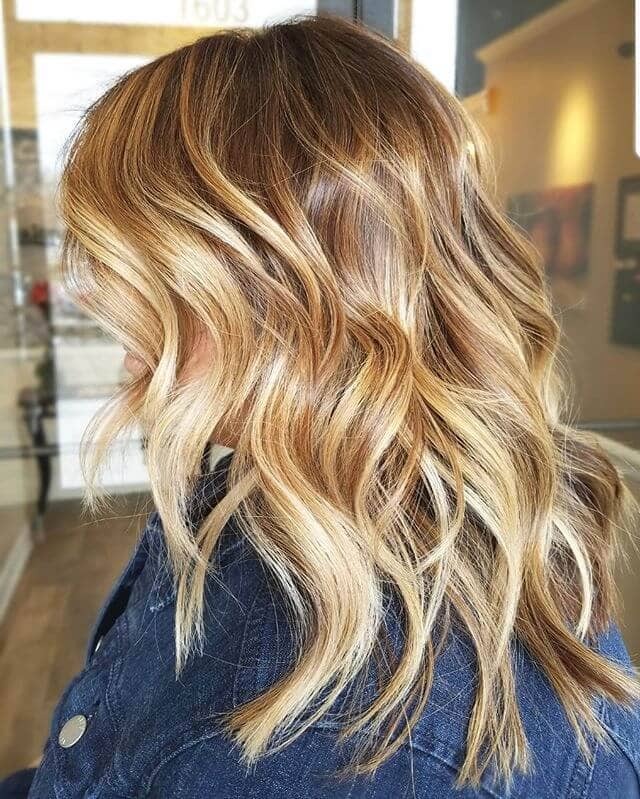 Delicate curls and lightened tips make this ombre hair coloring take on an all-natural look sunlit look. A cool hair trend for 2018. This gorgeous wavy long layered hair is the perfect and easy style for nearly every face shape. A simple all-day look that takes minutes to achieve and maintain. 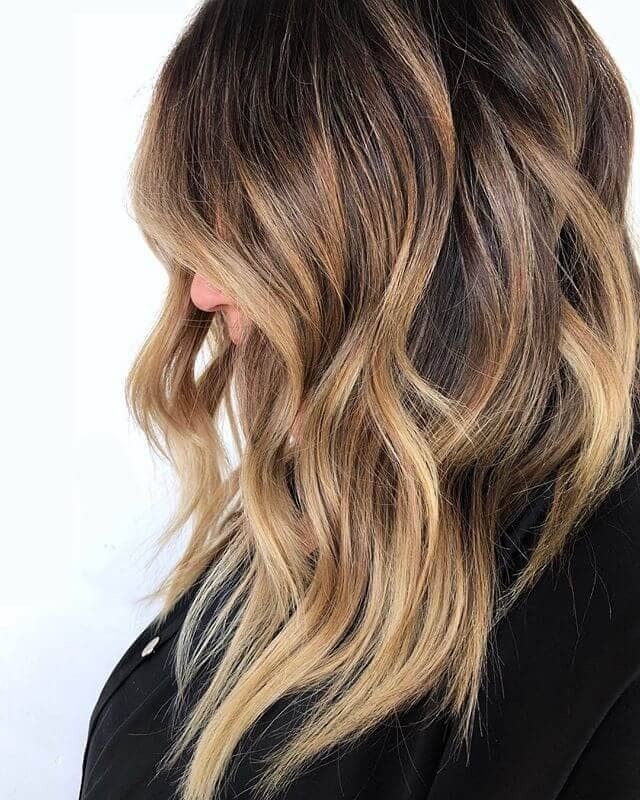 These layers have longevity, allowing more time in-between hair appointments–especially when paired with this dark to light coloring that allows for root growth. Layers will continue to add more dimension with growth too. An everyday, easy hairstyle for long layered hair, these short layers add volume and shape. Otherwise, boring hair becomes bouncy and light with the addition of curls to these shortened strands. 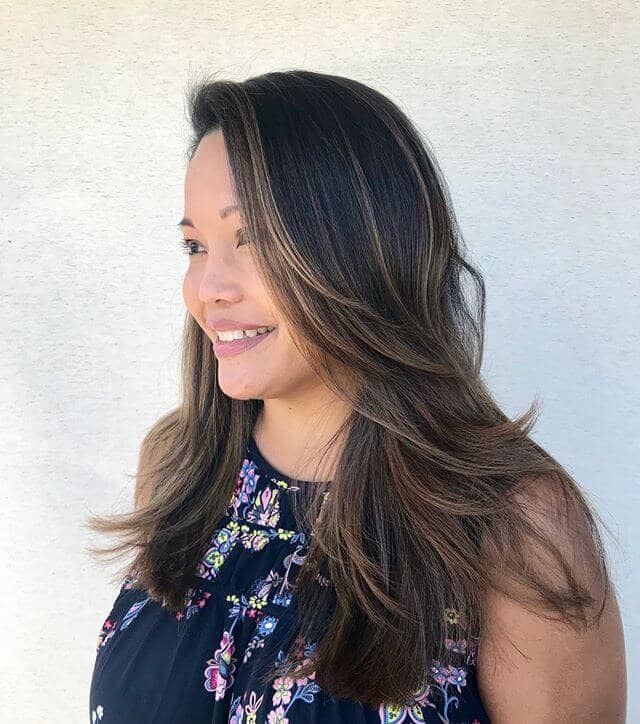 A beautiful hairstyle for women that lessens stronger facial attributes and boosts their feminine look while maintaining the professional attitude. These long and chunky curls pick up more volume with this trendy layered v-cut. Super long hair becomes even more flattering with this sultry v-shape. 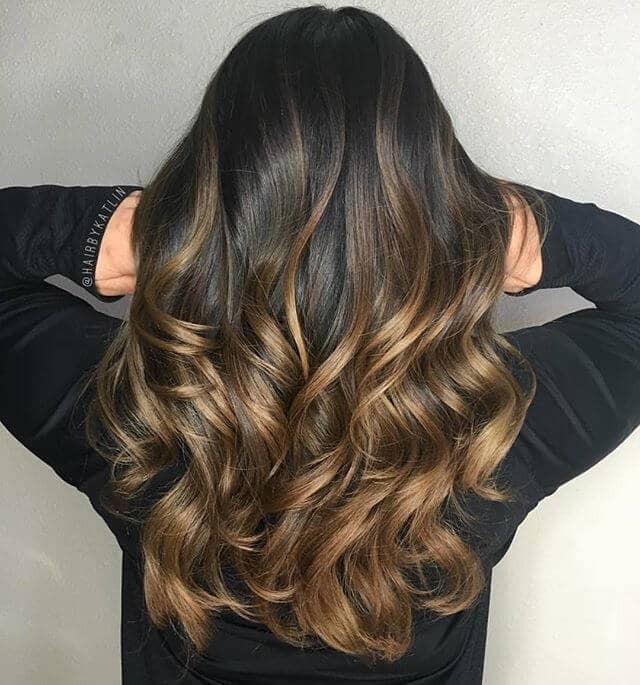 Natural ombre coloring accentuates the style making it even more glamorous with curls. This look can be a romantic, pretty hairstyle for a dressy event or as a cute down-do for a casual lunch. Adding layers to fine hair types can boost the hair’s natural appearance. 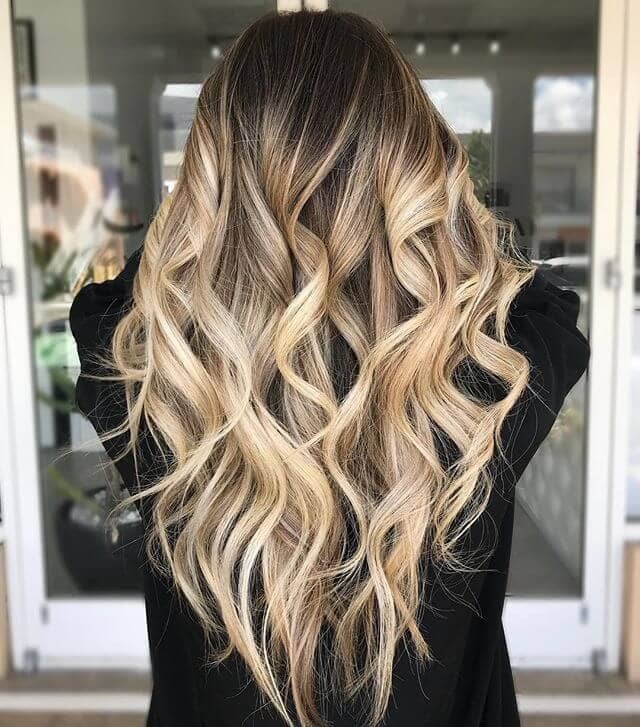 Loose and wavy layers are a simple and easy-going modern hairstyle for 2018. 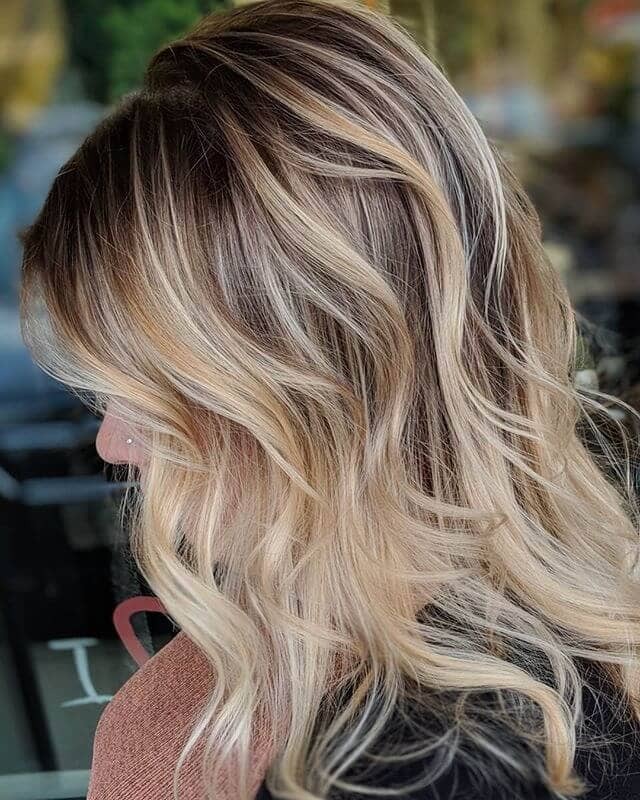 Adding a few highlights, like these golden caramel notes in this blonde coloring is a home-run. The highlights accentuate the texture and bring more movement. A classy and elegant hairstyle for women, these soft layers add modern sophistication to an everyday look. 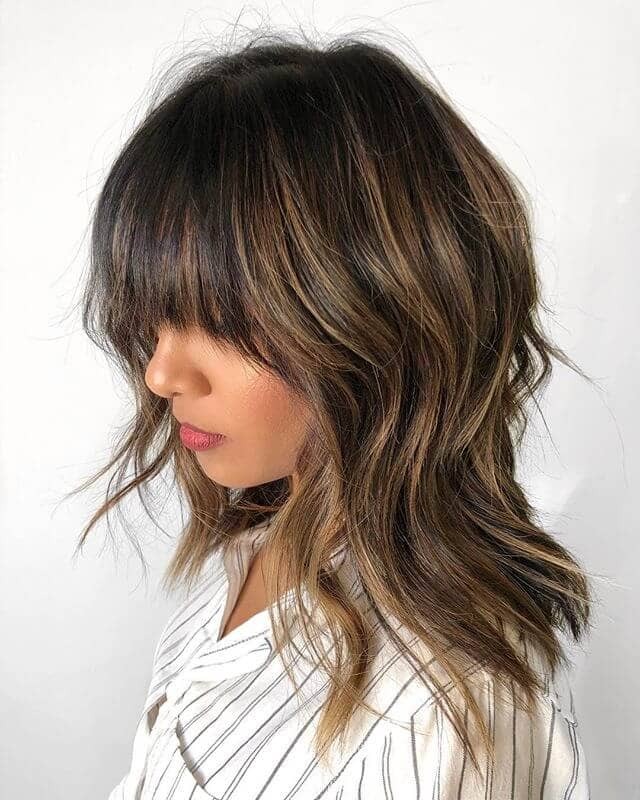 The style maintains the length, with shortened layers beginning at the midpoint bringing romance with soft but bold contrasting highlights that enhance the hair’s natural color. Completed with a casual side-swept part gives this long layered hair a touch of drama. There is something seductive about messy hair–especially when it looks natural. This sultry hot mess of long layered hair is so simple and yet so beautiful. 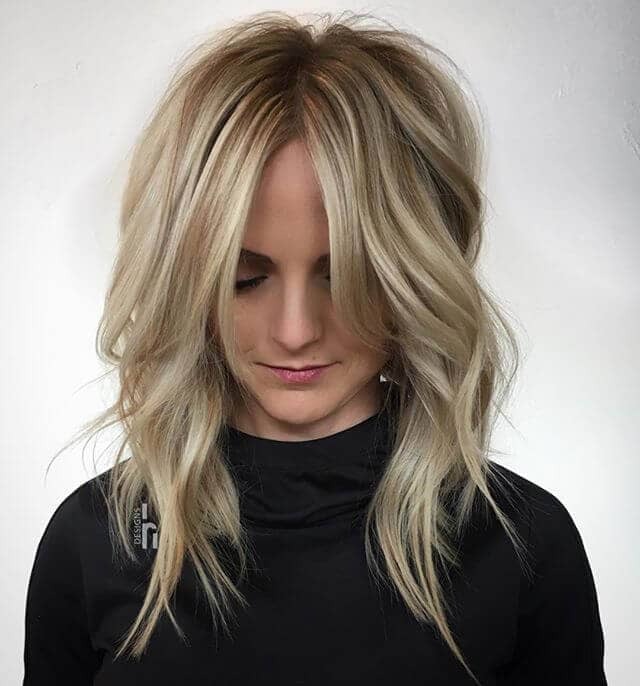 A stand-out color like this jaw-dropping blonde enhances that tousled look, while the v-cut shape adds more texture and volume to this long layered hair. For an edgy modern hairstyle, this blunt angled layered shag is an awesome look. 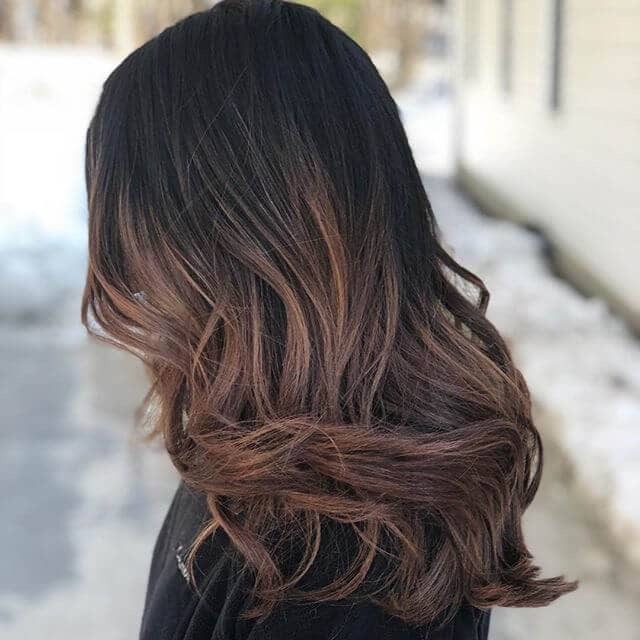 Dark roots and burnt copper tips look fabulous with these shaggy layers. Rock a carefree vibe with this everyday, easy hairstyle that is a great option with or without bangs. Looks like layers don’t have to be neat to be beautiful. This modern shaggy layered look is a fierce hair idea for those with bangs. 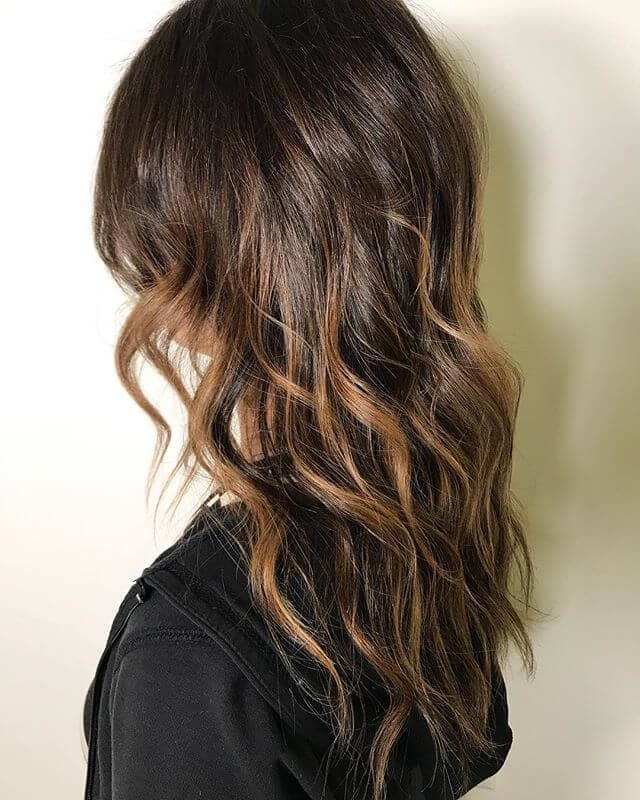 Brunette with blended copper highlights softens the blunt edges giving a wispy texture to these tresses. Retro inspired, thick and flat bangs bring rock n’ roll style to this shaggy cut. This popping cut looks great both personally and professionally. Angelic layers of soft blonde highlighted with golden brown highlights at the crown are a splendid choice for fairer skin types. Feathery cuts soften the hair and boost its luster regardless if it’s fine or thick hair. This feathered look is perfect for everyday shape and texture no matter the style–up or down. This cute hairstyle for girls or spunky modern hairstyle for women is all about using layers to add texture. Thick chunky layers that begin at the cheekbones add lift and texture with a few subtle curls. Extra volume on top provides a canopy of style. An above the shoulders cut with lots of messy layers turns out to be one voluptuous rocker hairstyle. 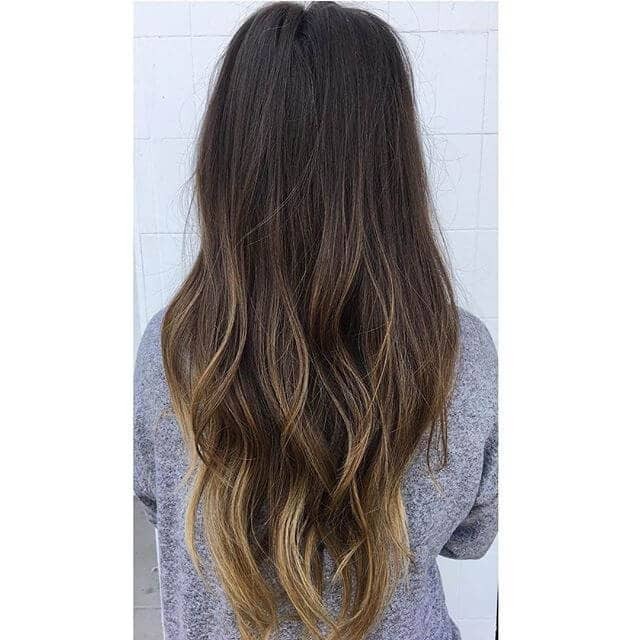 Long hair takes on more a more beautiful appearance with these subtle layered waves. Long, side, peek-a-boo bangs are the best hair idea for a youthful look. The soft highlights accentuate the serious hipster look. A cute hairstyle for girls with layers is easy to maintain and fun to dress up or down. 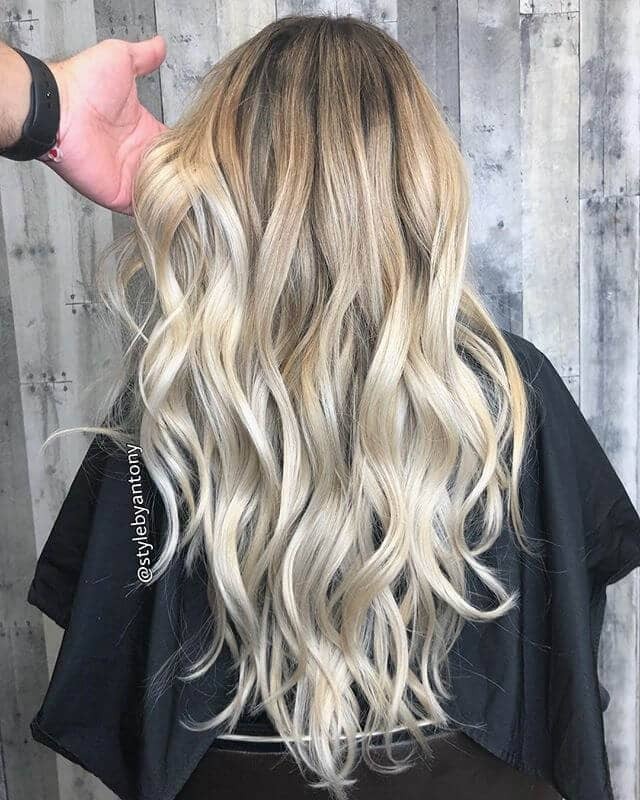 Layers bring more dimension to this full and wavy look. 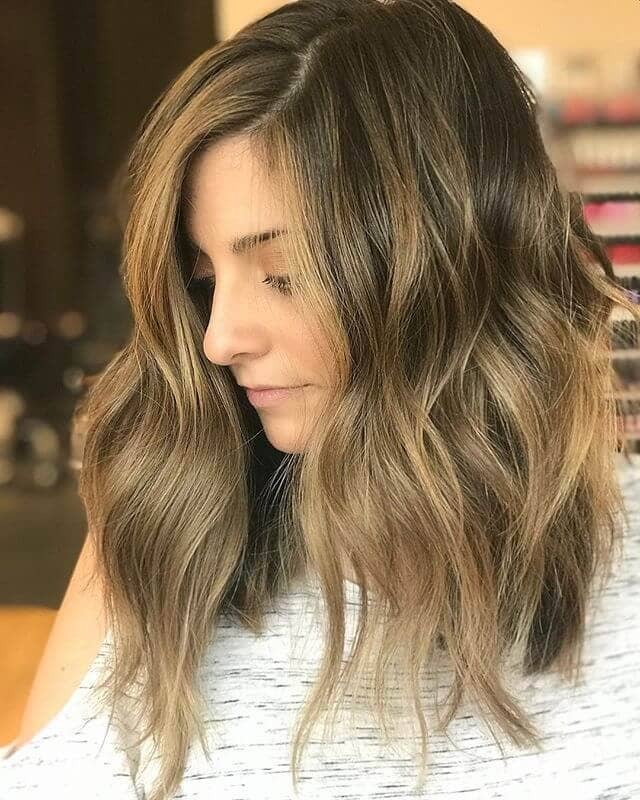 A great opportunity for fine and thick hair types to capitalize on layers–best achieved with multi-tonal hair color, these understated layers encourage volume and luster. Bouncy and full of volume, this is a pretty hairstyle for everyday wear whether around the home or at the office. 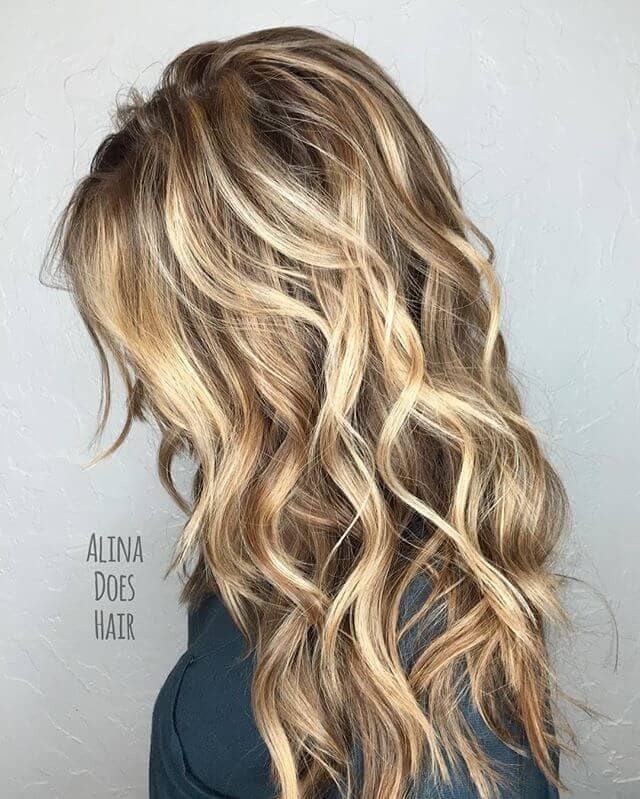 Naturally glowing hair color, this honey blonde, and golden yellow highlighted hair looks amazing with this layered shag cut. The perfect style to embellish the hair’s natural waves. Bright and shiny, this is the best modern hairstyle for 2018. Soft and silky medium tousled look is dazzling and fresh. A fabulous way to show off a stellar shag haircut, this super long shag is beyond hot. Long hairstyles with layers should showcase the length while adding texture and depth. Huge volume shapes the top while streaks of color blaze down the sides. This simple style frames the face softly with long parted bangs that disappear into wispy layers. Gentle and natural layers showcase the innate beauty in hair. 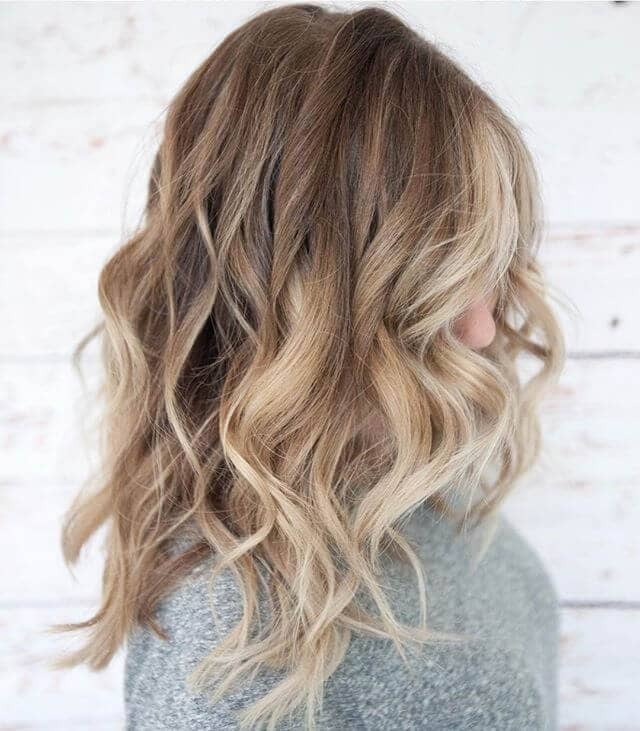 These careless layers paired with a natural looking ombre bring simplicity to a cute, ordinary day hairstyle. The u-shaped cut softens the ends while maintaining the fullness. 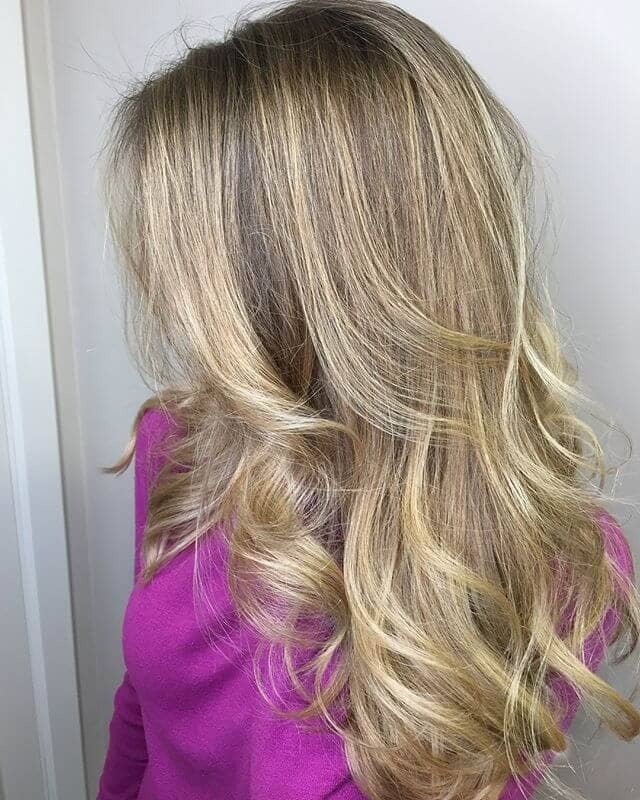 Light blonde highlights dazzle brilliantly as the light bounces across the hair. Cool and sultry, this long layered hairstyle is an awesome hair idea. Shaggy and long bangs that frame the face and blend into well transitioned choppy layers lends a depth of drama to this stylish cut. Best of all, this style requires little maintenance–long layers gradually growing to boost the effect. This mid-back u-cut delivers a lovely rounded shape with delicate sweeping layers. This long layered hair is a simple everyday look and easy hairstyle to retain. This style can be implemented by both thick and fine hair–with a quick accentuation of the tips, hair appears fuller and well groomed. Soft off the shoulder layers look picturesque in this shade of brunette with a pretty, dark auburn ombre. 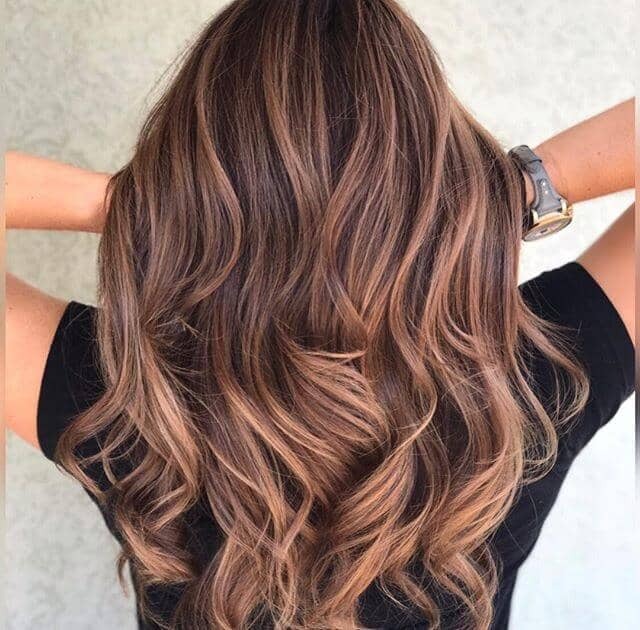 Dark to light hair coloring dramatizes this long layered hairstyle–a fabulous hair idea for brunettes. Streaks of dark auburn blend naturally into the natural brunette adding a natural elegance. Styling this cut with gently rolling waves gives it a timeless appearance. 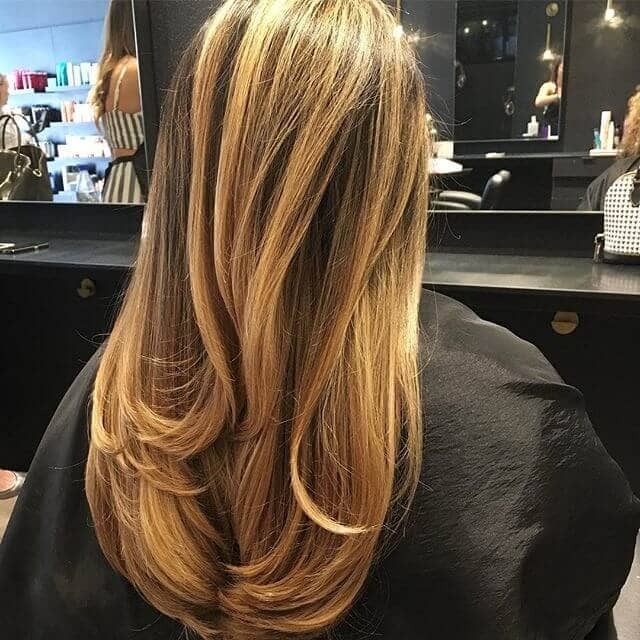 Beautiful swoopy layers of light ash brown look stunning with light copper brown highlights. A cute hairstyle for girls and teens, these sweeping side bangs bulk up the crown and extend the layers to frame the face for effortless styling. Creating a natural look while being full of style, this hair is ideal for a professional cut. 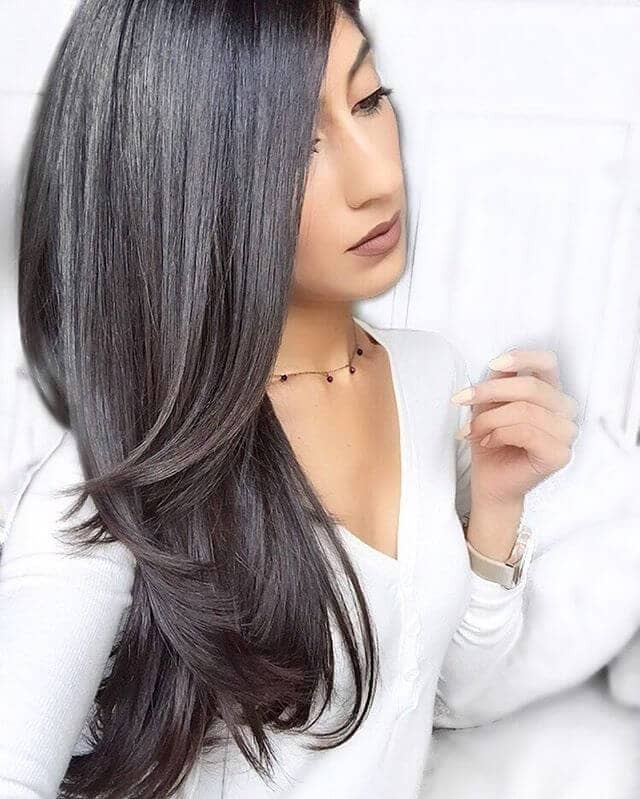 Thick, straight hair is enchanting in this dark black and brown shade which pairs well with medium and dark skin tones. Long layered hair with a natural side part uses long face-framing layers that blend into the cut. Long and angled swoopy layers soften the style and give a cleaner, pretty finish. Gentle curls embellish and lighten up the ends adding fabulous shape and style. Face-framing layers that can be swept back adds to the movement of the cut and gives this look a natural feel. A great style to choose for naturally wavy to straight hair types with minimal effort and maximum appeal. Coarse hair has the tendency to be a little on the frizzy side. Adding color to this blunt end layered look provides more dimension. This layered hairstyle embraces the natural frizziness with an on-the-go fashion that is ready to be worn up or down. An organic and modern hairstyle for an evergreen look. Long contrasting layered curls of dark brown and copper show movement and luster. Full of volume and natural style, the look shapes the head and appears thick and alluring. A beautiful and modern look at traditional coiffed curls, these gentle and natural looking curls loosely spiral for a romantic look. This ultra-cool and modern hairstyle shows off dramatic layers hidden in uniformity. Longer tresses in the front enable a stealthy a-line. 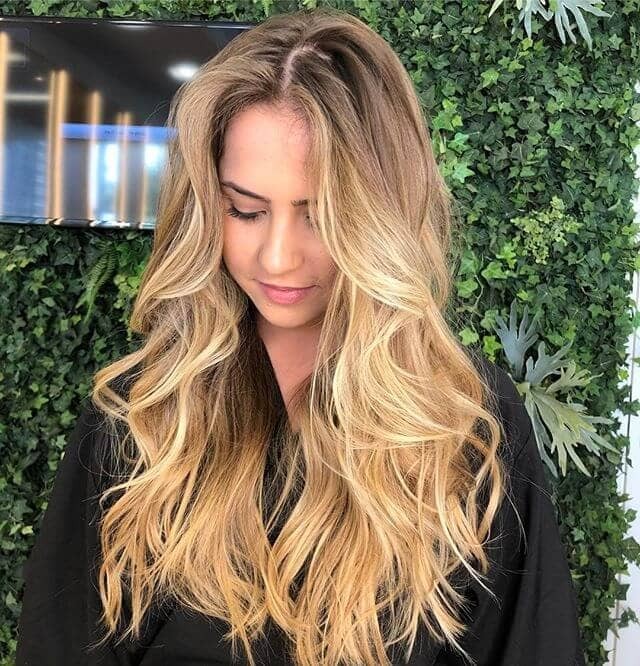 Feathery and soft spirals of sandy blonde locks with champagne and caramel blonde highlights look stunning in this beautiful cut. 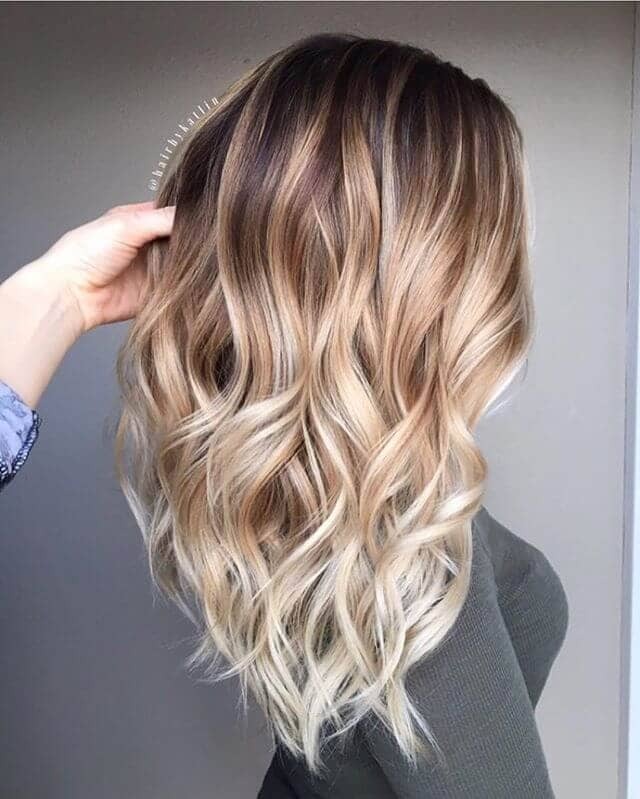 A perfect introduction to balayage highlights for 2018, especially for wavy hair. Natural color and a choppy layered cut provide tons of volume where it’s needed. Wavy tousled hair matches the cuts style–commanded by full arched bangs that follow the curve of the face. A fabulous look for square face types, offering a rounder appearance. This arched frame paired with wispy and subtle layers is a knock-out. Long and fine hair respond well to this effective layered look. A low maintenance and cute hairstyle for girls–this style adds a little bulk, combining side-swept bags that highlight the face and offer natural texture. Dramatic length combines with straight sophistication in this visually appealing cut. Styling is effortless and is a great option for both colored and natural hair. 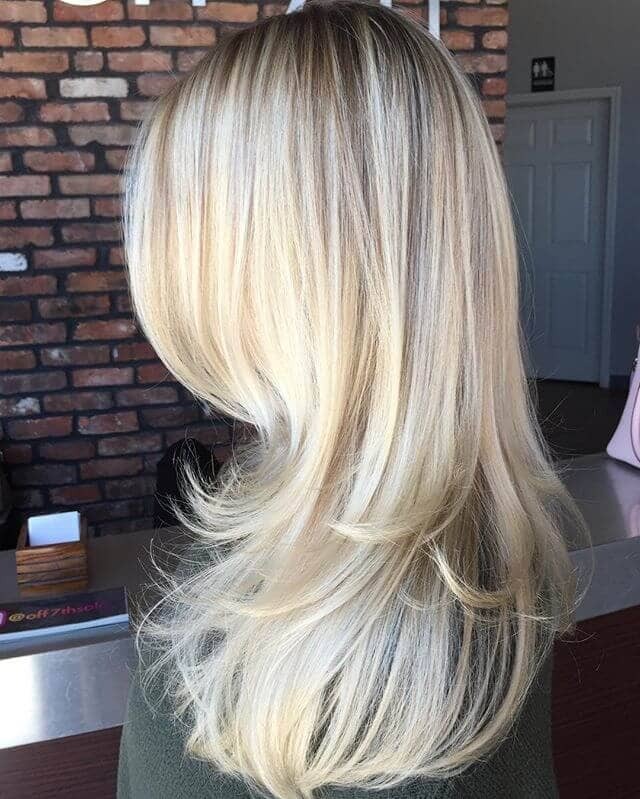 Radiant blonde, long and side-swept layers is a cool and simple hairstyle for 2018. Long and choppy layers are highly versatile. Wear them down for a delicate fringy look or soften them with a quick flip at the ends with a curling iron. Long and dramatic side-swept bangs can be dressed up by pinning the off to the side or in the back. Timeless long hairstyles with layers begin with elegant style and grace. 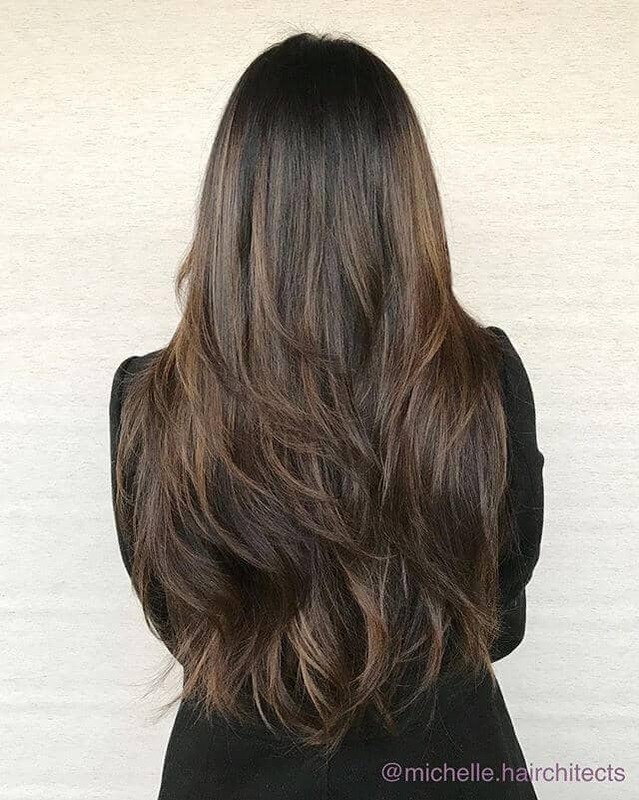 Long and thick hair can get awfully heavy, but the addition of layers can lighten the load in full-length style such as this one. Natural coloring creates an elegant look that maintains its fun and flirtiness. A u-shaped cut softens the symmetry and maintains the full-body effect. Adding layers to medium-long hair lengths needs careful thought and attention. Beginning the layers to soon results in stray pieces unable to be picked up when worn up. 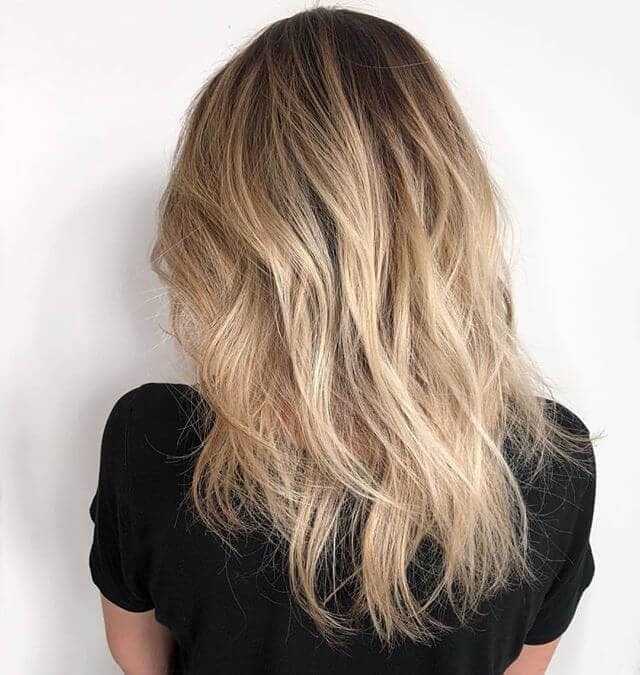 The shortest layers begin at the shoulder length in this well-planned cut–allowing for more up-do options as well as cool layered style when worn down. 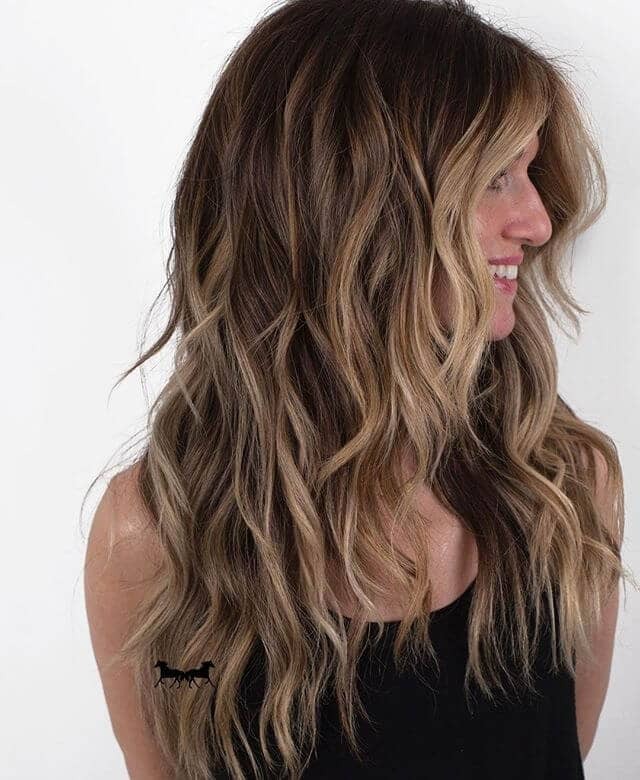 With luxurious length worthy of envy, this long and blunt layered cut is full of beach blonde style. Another great hair idea for coarse and wavy hair types that accentuates the hair’s natural tendencies. Crude and choppy layers are deviously hidden among brightened hair to accentuate the natural waves. An effortless hipster cut that looks uncomplicated but remains stylized and luxurious. Long cascading strands of cinnamon auburn can fall flat and unremarkable when kept at one length. 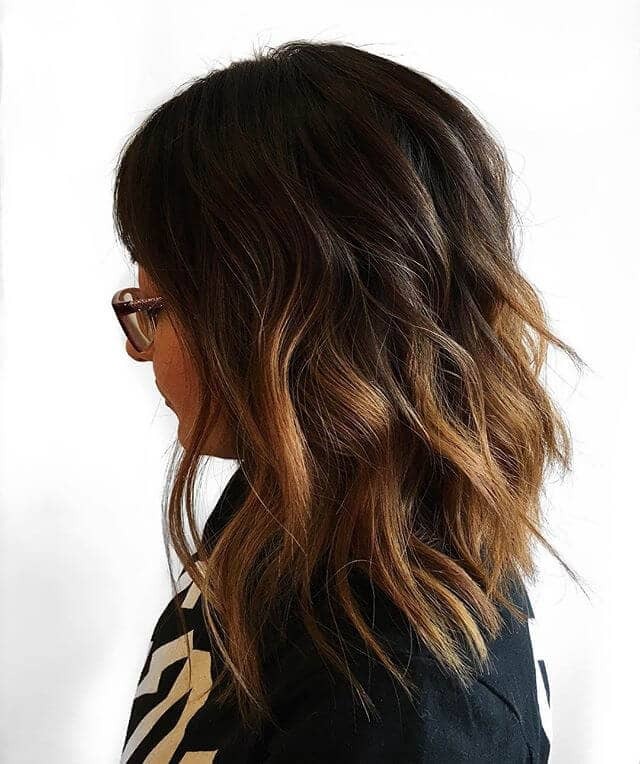 Adding layers to this super long, one color style–bumps up the volume and prevents hair from looking stringy. The result is soft and glamorous while maintaining a sassy and frisky flair. Best for those in a professional setting looking to get some notice. A flirty modern hairstyle perfect for 2018, this off the shoulder cut with minimal layers can boost volume and texture. Messy and tousled for a quick on-the-go hairstyle that is ready for action. This slightly pitched and angled A-line cut elongates the face and is reminiscent of a classic bob. 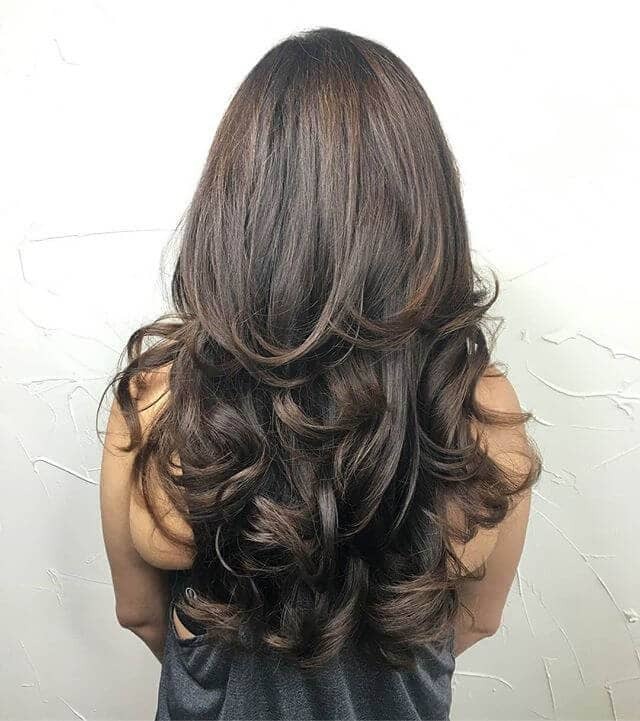 Full and bouncy curls suspended in cascading layers makes for an incredibly beautiful hairstyle. Capitalizing on the length with the addition of four or more layer lengths compliments the shape of this full u-shaped cut. Big, wavy, curly tendrils of hair are full of dimension and shine for an unbeatable pretty and romantic vibe. Perfect for full, thick, and coarse hair types–these long wavy layers are stunning. 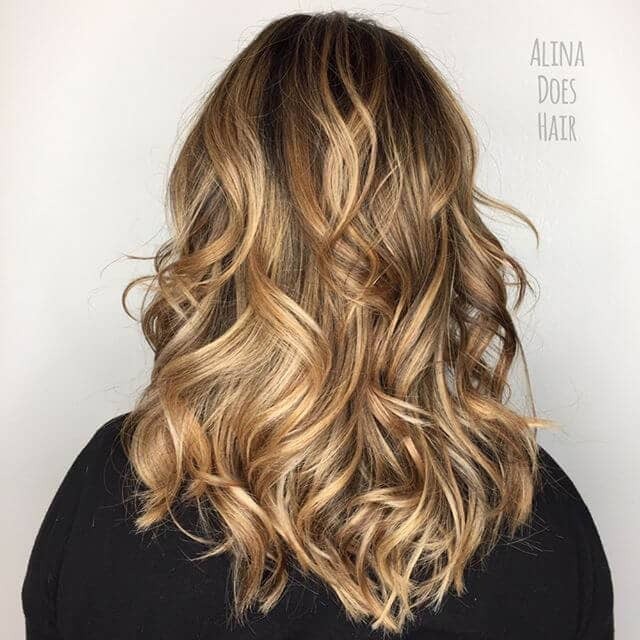 A cute hairstyle for girls and teens, this feathered and layered cut pairs well with a variety of color blends–the perfect layered style to accentuate balayage highlights. Creating a soft look that combines with natural coloring for a timeless look. 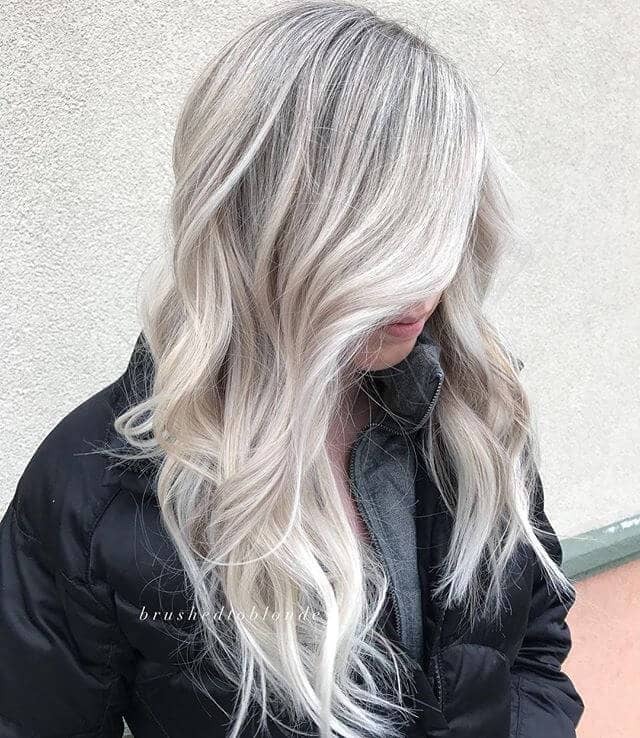 Iridescent color with notes of grey and platinum blonde look stunning with softened tousled layers. Fine and thin straight hair gathers dimension and volume from these nifty layers. Layering begins just past the shoulder length adding texture that is easy to maintain. The coloring is unique and pairs well with the cut. 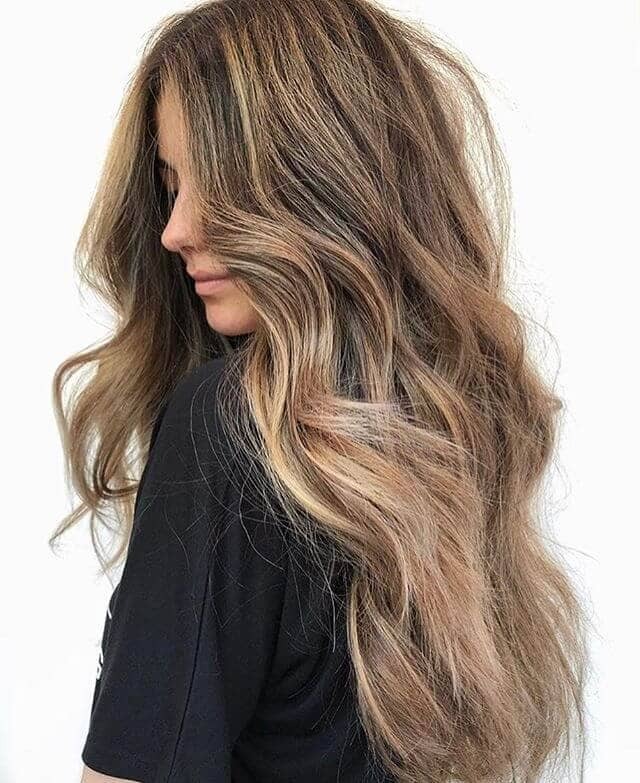 A natural everyday look, this tousled layer of brunette hair with streaky caramel highlights is an awesome style for any age range. Wispy layers look ultra-feminine paired with chunky lowlights that would have otherwise been lost. Carefree and low maintenance this modern hairstyle is a winner for 2018 and beyond. Blunt, smooth or anywhere in the middle–adding angled cuts turns ordinary hair into so much more. This slight A-line cut with subtle layers and natural ombre is a cute easy hairstyle for girls and teens. The pitched angle delivers a high-low bob, while the addition of layers boosts the texture. 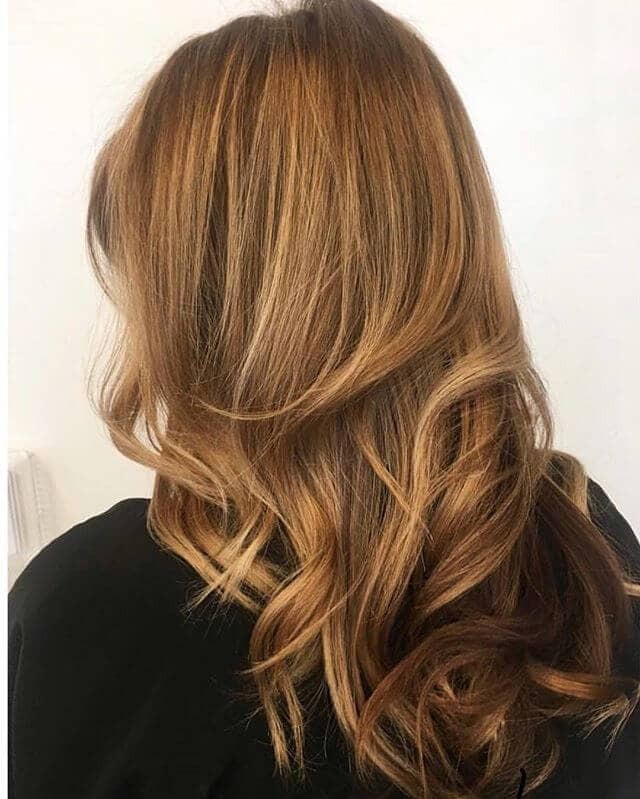 Rooty, natural blonde punched up with buttermilk and golden blonde highlights are lovely tousled in natural looking spirals. The layering is deceptively hidden throughout the cut with choppy precision for a modern look full of dimension. Quick to style and easy to manage, this is the best style for those on the go. Hair appears longer and healthier with this natural dipped tip effect. 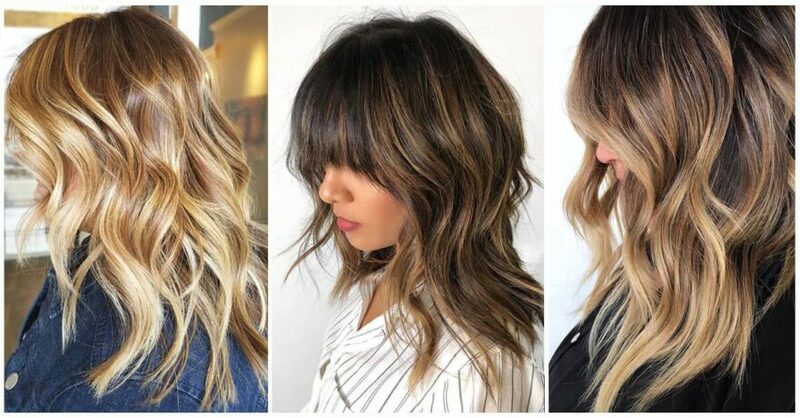 The layers pop with sun-kissed perfection that accentuates the length and dramatizes movement. The layers begin further down on this cut to off-set the length, while ombre tips give it an awesome trendy vibe. A pretty hipster style cut and color that is trendy and exclusive. Face-framing layers are gorgeous and subtle in this perfectly waved tousle. Long, icy blonde hair becomes textured with choppy with jagged layers that make styling a piece of cake. 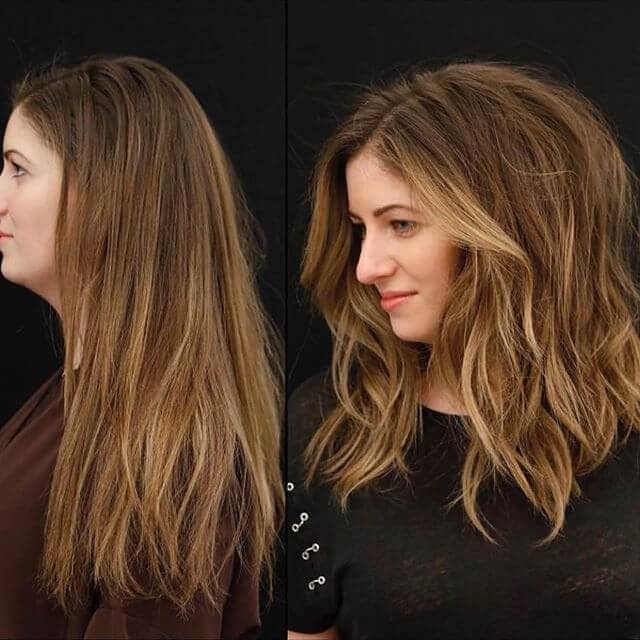 A fresh and quick layered hairstyle that bounces with light. Naturally, wavy hair is amplified with the unique frosty coloring. 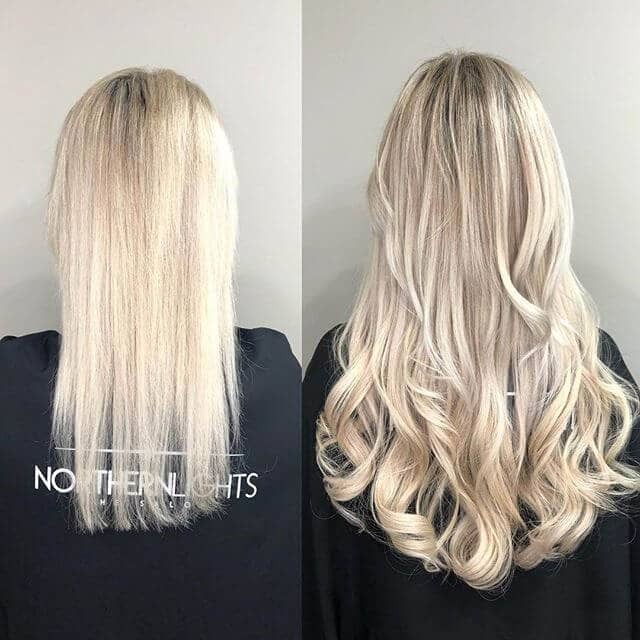 Low maintenance, great for any hair or face, and a variety of styling options–long layered hair is an incredible choice for your next haircut. With a wide range of looks and colors, that magazine quality look can be had instantly. Highlights and lowlights both make your hair look extravagant as the color bounces off the separate layers. Your hair will never appear more filled with length and volume. This hair choice is magic. A hairstyle is your first impression to the world and this look is the optimal decision. This list of 50 long hairstyles with layers should provide to be a great source when you’re thinking about your next haircut–you’ll wonder why you didn’t make this decision sooner.